I have been fascinated by the concept of lawn-mower racing since high school, when a guy in my grade, who called me “Vroom Vroom” because I liked NASCAR and often yelled “VROOM VROOM!” over everyone’s heads to get my attention in the hallway from many feet away, mentioned it once. “You ever heard of lawn-mower racin’?” he asked. I hadn’t, but he seemed like the type to know it existed. He told me how great it was, and I believed him. How couldn’t it be? At that moment, new world was opened to me. That brings us to this week, when Honda announced that it’s going to try to go more than 150 mph in a lawn mower. More than 150 mph! In a lawn mower! What a concept. See, Honda used to have the world record for fastest lawn mower at an almost 117-mph average speed on a straightaway a few years ago, with a vehicle called the “Mean Mower.” The mower topped out around 130 mph, and could cut grass at around 15 mph. Then, a Norwegian group had the audacity to come in and run 134 mph in late 2015. If you know major carmakers, you know taking away their silly world records that don’t mean much in the big picture can’t stand. So, the Mean Mower V2 came along. Honda UK announced Wednesday that it wants to hit more than 150 mph in the new mower, which has a 999cc inline four-cylinder engine from the CBR1000RR Fireblade SP motorcycle that makes 190 horsepower at 13,000 RPM. Honda said the new mower has almost double the power that the last one did, and that it can go from 0 to 60 mph in less than three seconds. 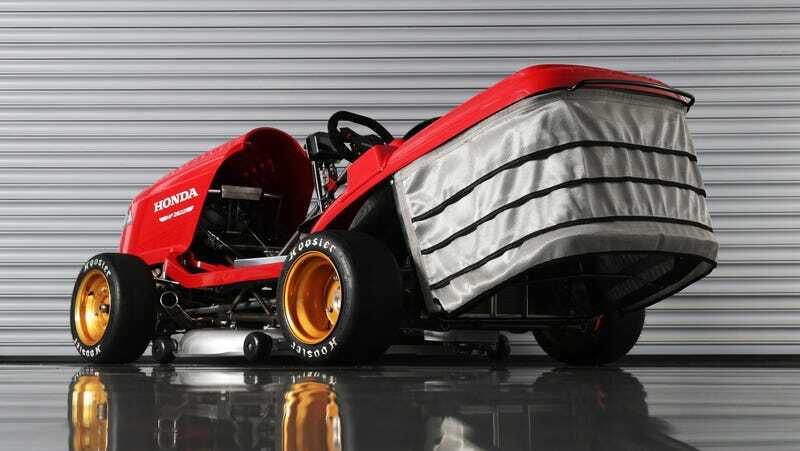 Jalopnik has asked Honda the top speed at which the new lawn mower can actually cut grass. We’ll update this story if we hear back. Vroom vroom, Honda. Vroom vroom. Update, July 11 at 2:12 p.m. Honda said it ran the numbers and that in the right circumstances, its new Mean Mower can probably cut grass at up to 50 mph.